There are multiple artists with this name: 1) Nile is a technical death metal band from USA. They formed in their hometown of Greenville, SC, in 1993. They combine extreme speed and brutality of modern death metal with the ancient styling of middle eastern music. With their self-proclaimed trademark of "Ithyphallic-metal", Karl Sanders (guitar/vocals), Chief Spires (bass/vocals), and Pete Hammoura (drums) debuted with their "Festivals of Atonement" album in 1995, leading Nile to a southwestern tour in support of other big metal acts such as Obituary, Deicide and Broken Hope. 1) Nile is a technical death metal band from USA. They formed in their hometown of Greenville, SC, in 1993. They combine extreme speed and brutality of modern death metal with the ancient styling of middle eastern music. 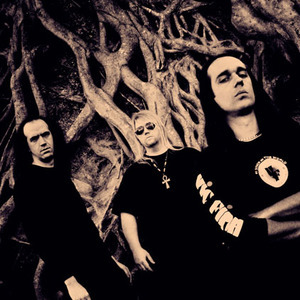 With their self-proclaimed trademark of "Ithyphallic-metal", Karl Sanders (guitar/vocals), Chief Spires (bass/vocals), and Pete Hammoura (drums) debuted with their "Festivals of Atonement" album in 1995, leading Nile to a southwestern tour in support of other big metal acts such as Obituary, Deicide and Broken Hope. Viscera Productions was responsible for Nile's follow-up EP "Ramses Bringer of War" in 1997 and was going to release their second album "Amongst the Catacombs of Nephren-Ka", if they hadn't gone out of business later that year. However, relapse records was more than happy to put it out in early 1998, giving Nile a wider distribution and a chance to hit the road with Incantation and Morbid Angel. The follow-up, "Black Seeds of Vengeance", was released in late 2000. Prior to this release, Pete Hammoura left the band due to injuries sustained in an accident, feeling he could no longer drum at the level which Nile required. Derek Roddy drummed on all of the tracks (except "To Dream of Ur") as a guest. Also prior to "Black Seeds of Vengeance", Dallas Toler-Wade joined as a second guitarist/vocalist. A collection of remastered, hard to find recordings, "In the Beginning" was released later the same year. Chief Spires left the bands a few months after the release of "Black Seeds of Vengeance", citing personal and professional differences. He was replaced by John Vesano. The band also found a new drummer in Tony Laureano. By 2002, the highly anticipated "In Their Darkened Shrines" was released and the buzz around it led to mainstream coverage the band had never experienced before. "Annihilation of the Wicked" was released in 2005. New drummer George Kollias stepped in to fill Tony Laureano, who left before the recording began. After recording the bass for "Annihilation of the Wicked", Jon Vesano also left the band. He was temporary replaced by Joe Payne on the following tour. On July 20th 2007, the new Nile album, entitled "Ithyphallic", hit the stores in Germany, and July 23 in the rest of Europe. The bass on this album was played by guitarist Dallas Toler-Wade. On the "Ithyphallic"-tour 2008 the bass job was executed well by Chris Lollis, also a guitarist. For some time it was not settled whether he should fill the highly technical but still withdrawn role as Nile's bass player permanently. Recently, he has left the band for unknown reasons. "Those Whom the Gods Detest" is their sixth studio album. The album was released on November 3, 2009, in North America, and on November 6, 2009, in Europe through Nuclear Blast. It was produced and mixed by Neil Kernon, with Erik Rutan handling the drum recording. The album debuted at #160 on Billboard 200 list in United States. 2) Nile is a trip-hop artist hailing from the UK, of French / Native American origin. She has an album called ?Born'.